Ya know, somethimes life don't fit in a box. I found this to be true when trying to wrap gifts for a wedding. One thing came with a box and that was good. Then one came in the strangest shaped packaging so I combined a short oval box with some cardboard to make it taller and then placed the lid on before wrapping. And then there was the stack of soft items with no packaging at all. I rolled each one individually and made one big self-contained oval of them. 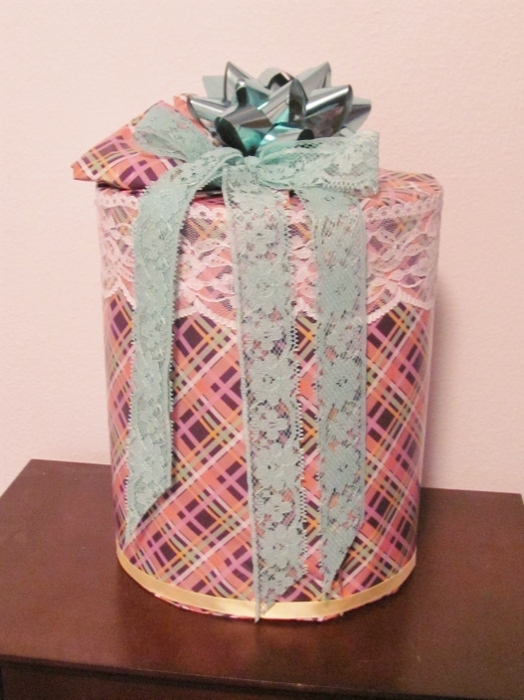 I used extra layers of wrapping for stability. 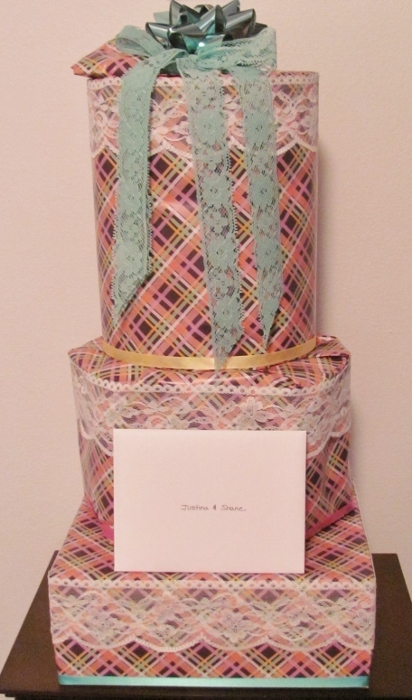 So, look what happens when they all get stacked up on the gift table - a little wedding cake! That explains why the lace and ribbon trims are all at the top and bottom of each package. I just thought this was fun. 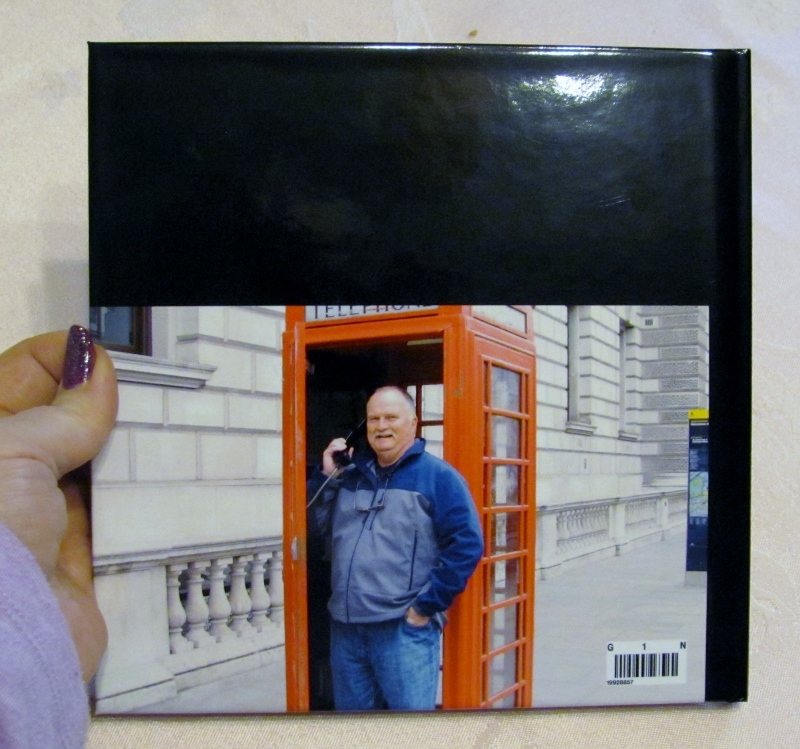 I was fortunate enough to get another coupon from Shutterfly - this time for a 20-page hardbound full-color book. All I had to pay was a small shipping fee. 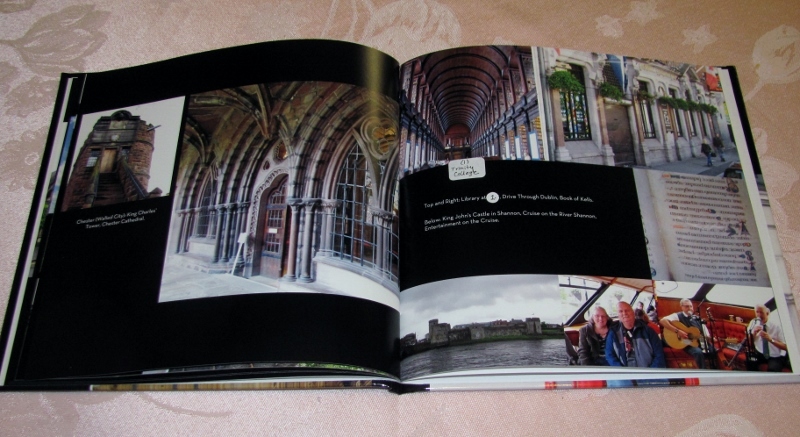 The website allows you to choose a 'theme' for the page backgrounds. I selected solid black pages with white text. 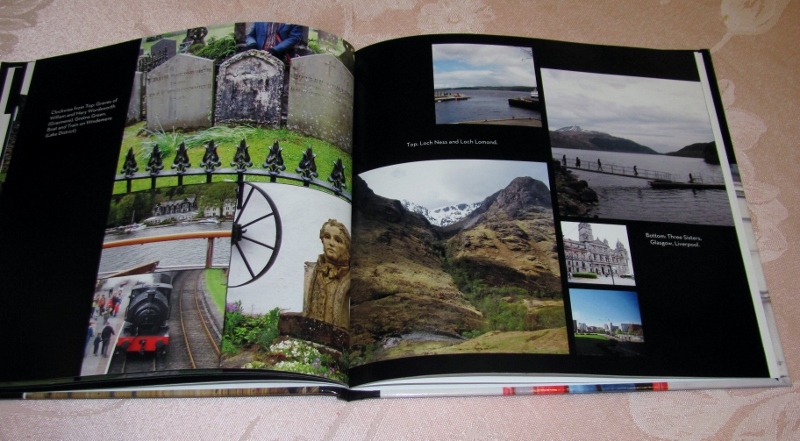 As you go through the process you get to specify how manu photos you want on each page. You are then presented with sample layouts that have that number of spaces as well as a text block on many of them. Whenever I had a layout without a text block I made sure the facing page had one that I could use to reference across the gutter. 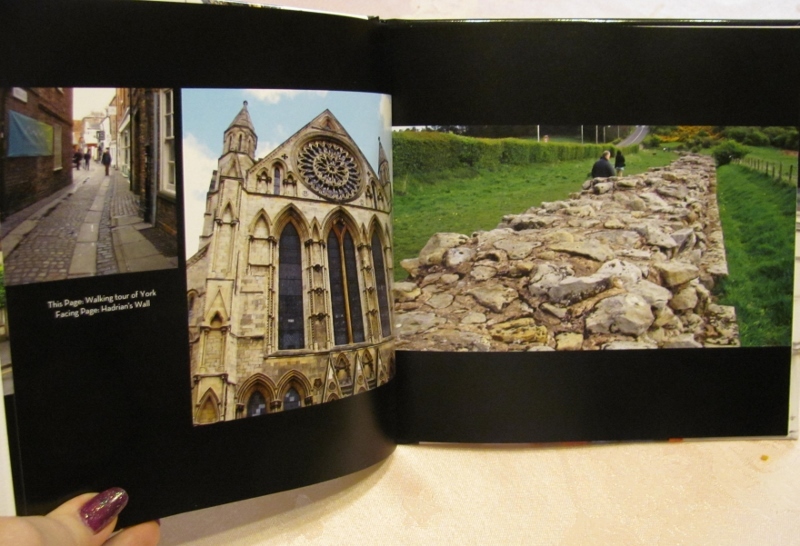 I had SO many photos from out trip to the UK last spring that I decided to use them to create a book documenting it. 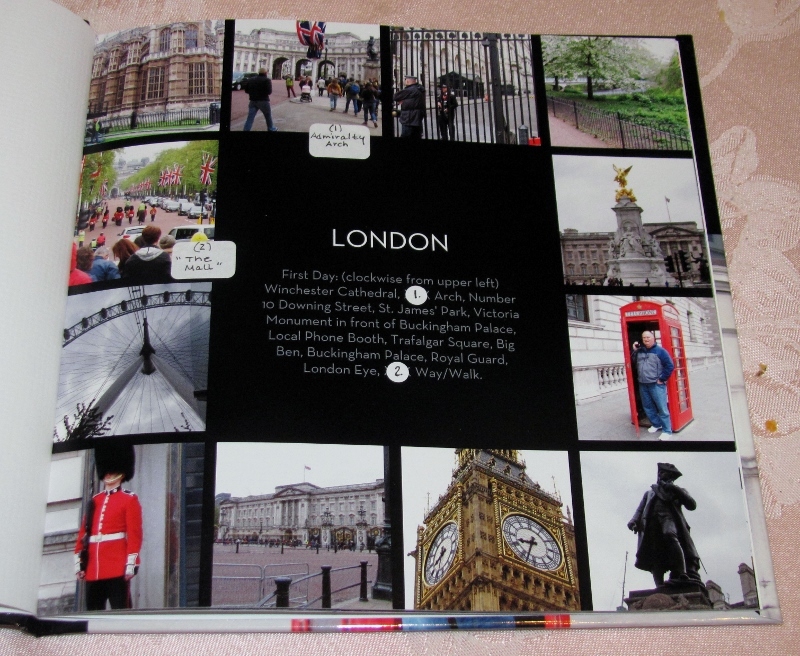 My first page was all about our day in London. This was an excellent layout to include a dozen photos. You can see where I and typed out some placeholders ("XXXX") where I needed to look up the official name of a landmark. 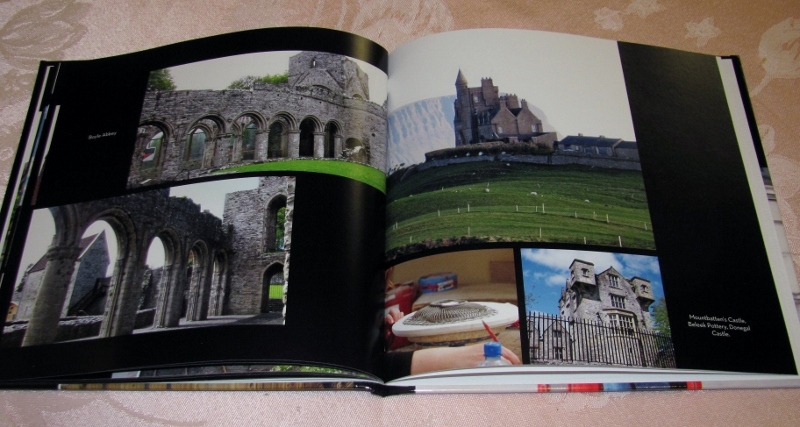 Unfortunately, by the time I got to the end of the book layout I forgot to go back and fix those placeholders. So when I got the book, I used white dots to cover up the Xs with a number and added a label next to the photo with the name written in. 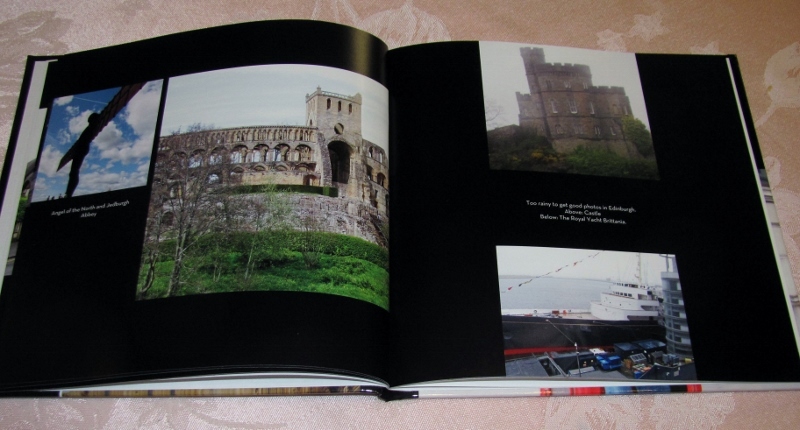 Since the facing page is blank I may add a map that shows the locale of each of the sites. 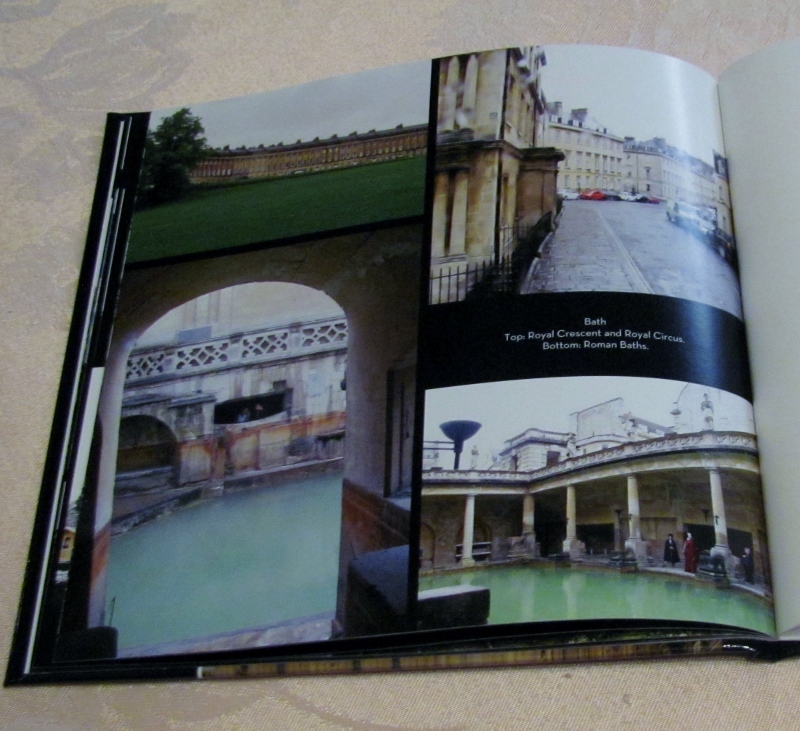 The rest of the book follows in order of the places visited. 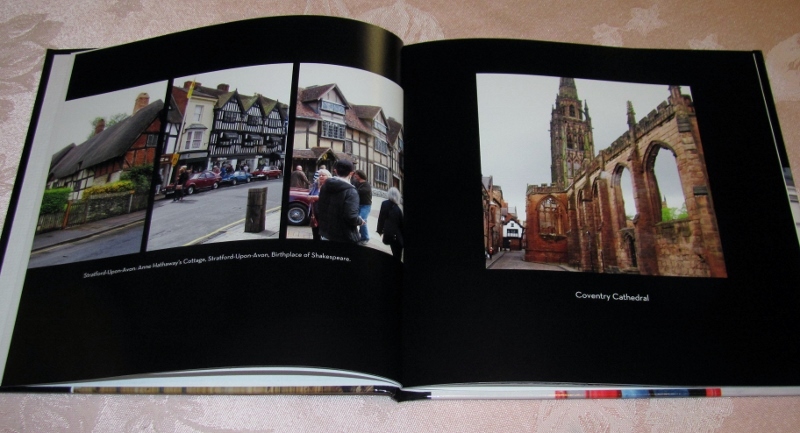 This spread includes Stratford-upon-Avon and Coventry Cathedral. 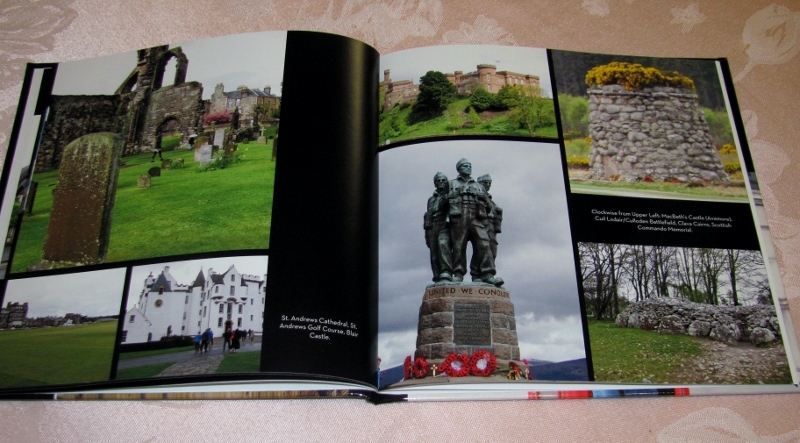 On the left are St Andrews and Blair Castle and on the right are MacBeth's Castle and some battlefields and memorials we visited. 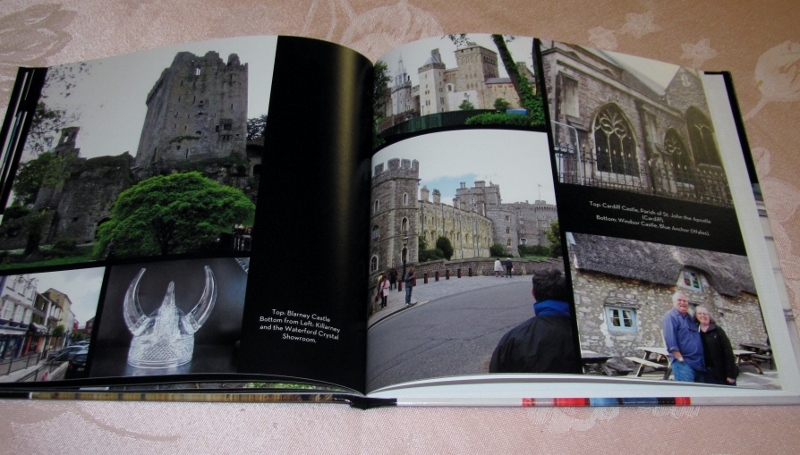 You can see by the hand in the photo above the size of the book - the pages are 8x8. 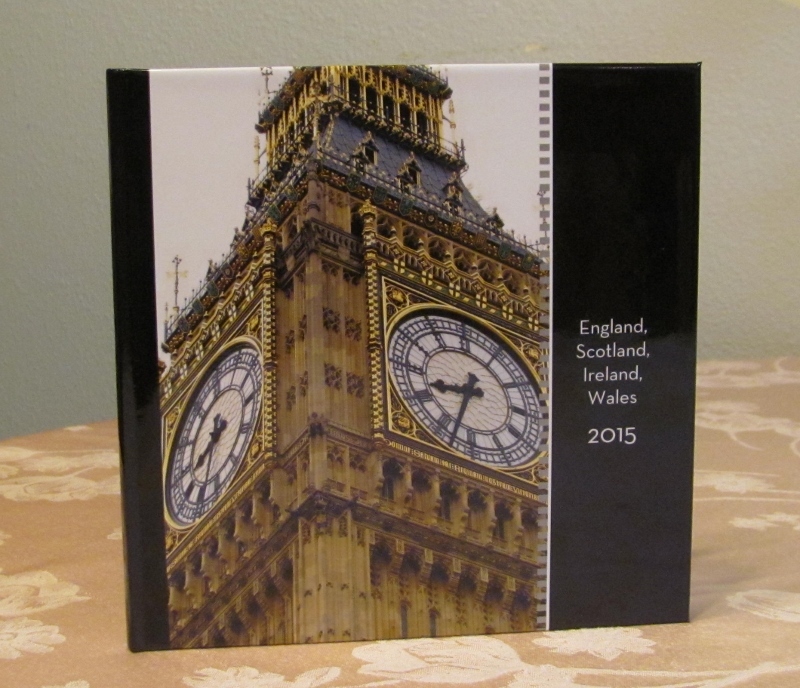 I have no association with Shutterfly - I'm just a satisfied customer. 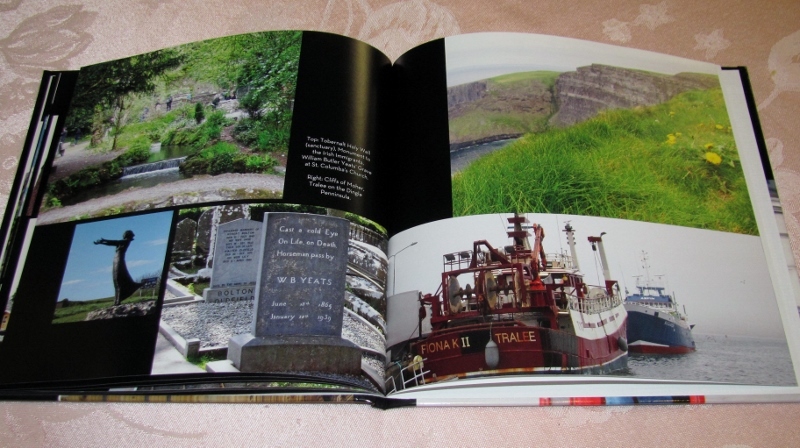 They have lots of products to choose from - larger books, mugs, postcards, greeting cards, and more - all featuring your own photos. If I have another opportunity to use them for Books or Calendars like I already have, I will definitely do it. For my birthday I was given a frame, some buttons, and directions for the idea of making a sign for my quilt studio. We brainstormed for a good phrase to use and I set to work. I had some flocked paper in rolls and selected a burgundy for my background. 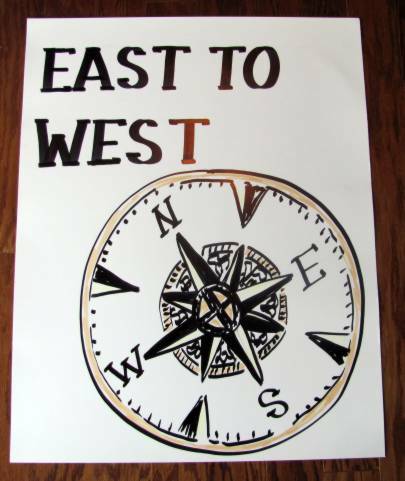 I found the easiets way to mark the lettering after I had printed it out in the size I wanted was to lay it over the flocked paper and pierce the outline of the letters. When the pattern was removed I had dotted lines to guide me. I chose to use "Crafter's Pick : the Ultimate" glue as I knew it would adhere to both the buttons and the flocking. 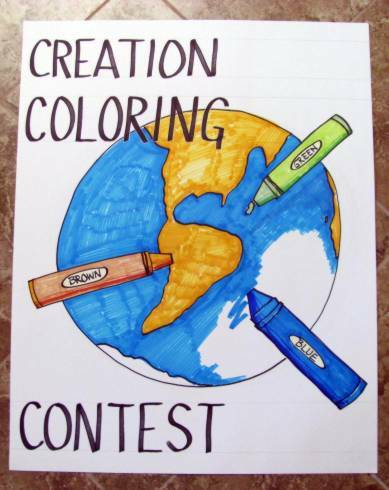 I drew of line of glue with a toothpick over the dotted line of a letter and then placed the buttons in random colors. 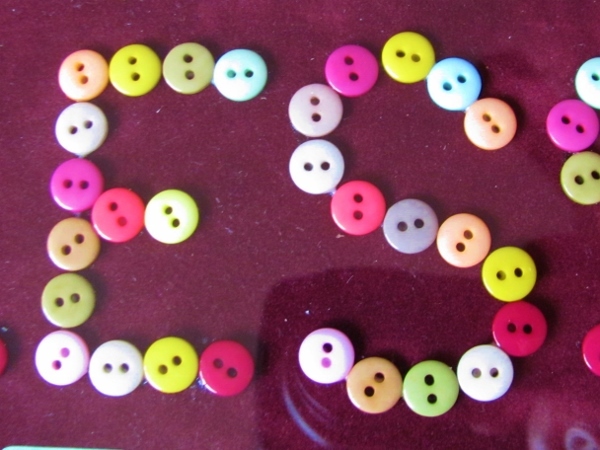 You can see that I did not try to line up the holes in the buttons, but allowed those to be random as well. 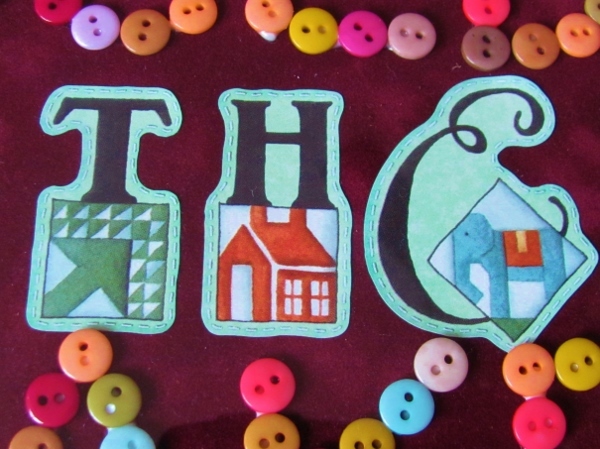 The words 'are' and 'the' are made up of some quilt-theme stickers that I already had on hand. 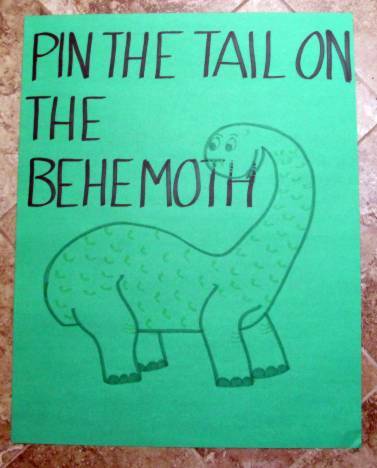 That's a further reinforcement of the theme of the sign. 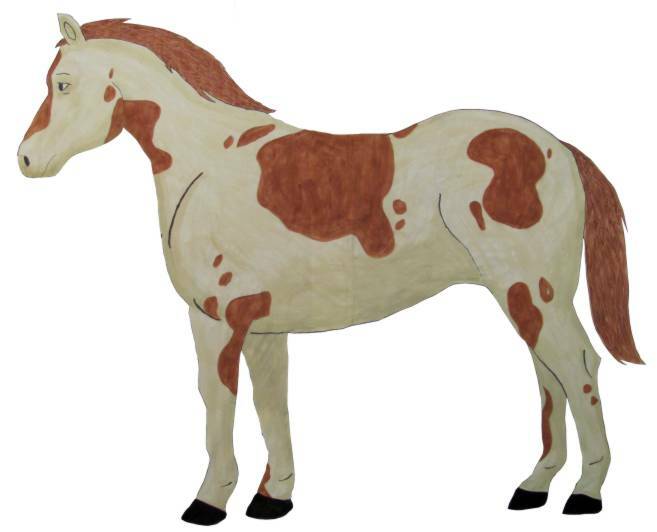 This is going to look GREAT in my quilt studio! 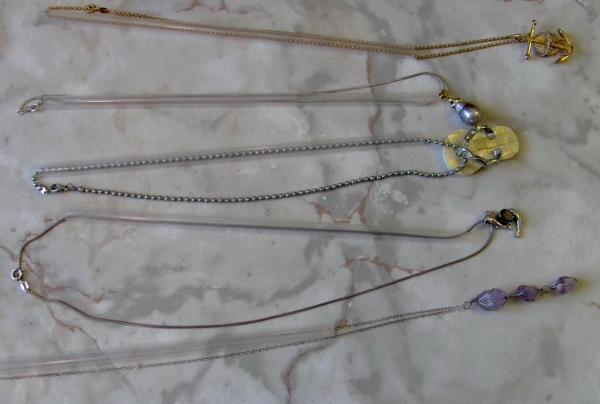 As I was packing for a recent trip I remembered a tip I saw online about packing necklaces with straws to keep the chains from tangling. It was brilliant, I remembered thinking, so I proposed to give it a try. 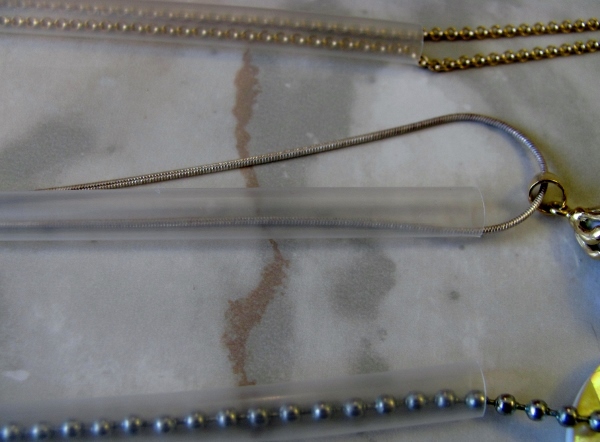 The idea is that you unhook the fastener, pass one end of the chain through the length of a straw and then fasten it up at the other end. If you wish to use the same technique with a shorter chain or a bracelet you can easily snip the straw shorter with scissors. See how nicely they lie? Here's a closer shot of it. 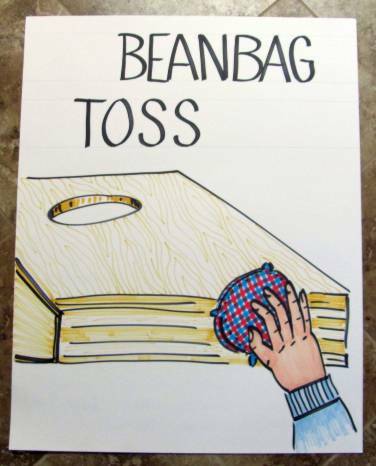 These can be laid in the bottom of a bag and cannot tangle around one another at all. What a great idea. It would even work to store them like this in the jewelry box as I am always trying to untangle them to wear. It would make selecting one easier, too. Tired of chilly weather, I was inspired to work on a 'spring' project. 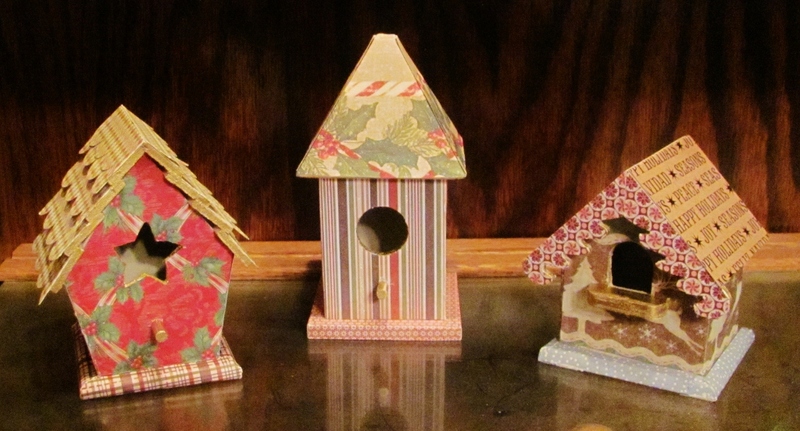 I gathered the three remaining wooden birdhouses I had bought a while back for altering. 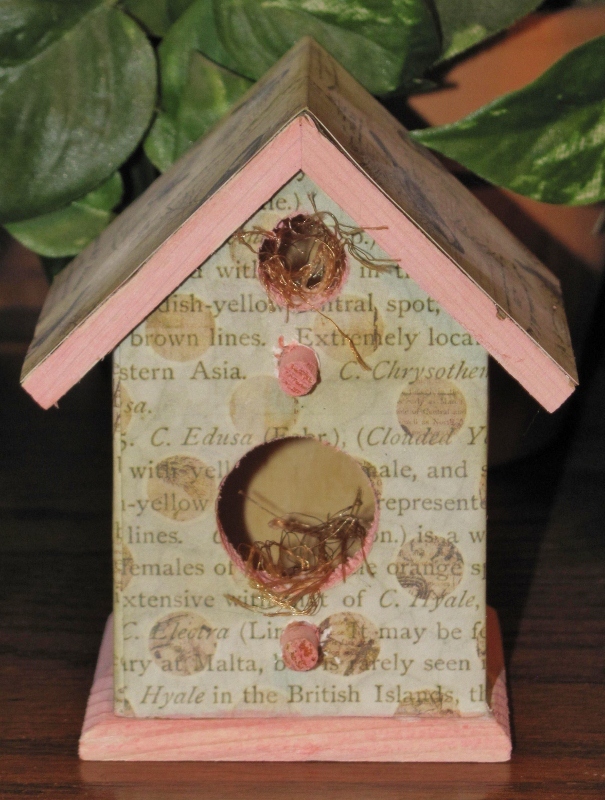 The common element on all of these houses is that they have two entrance holes for the birds. 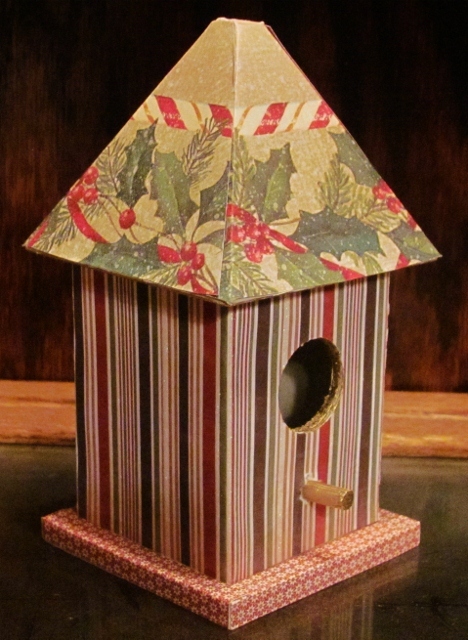 I selected a variety of bird and spring printed cardstocks to use on these. I trimmed the papers to fit the flat surfaces - two per house - and attached them using Scor-Tape (it holds like nobody's business). I used Distress Markers to color the exposed wooden surfaces - roof edges, bases, perches, and inside the holes. 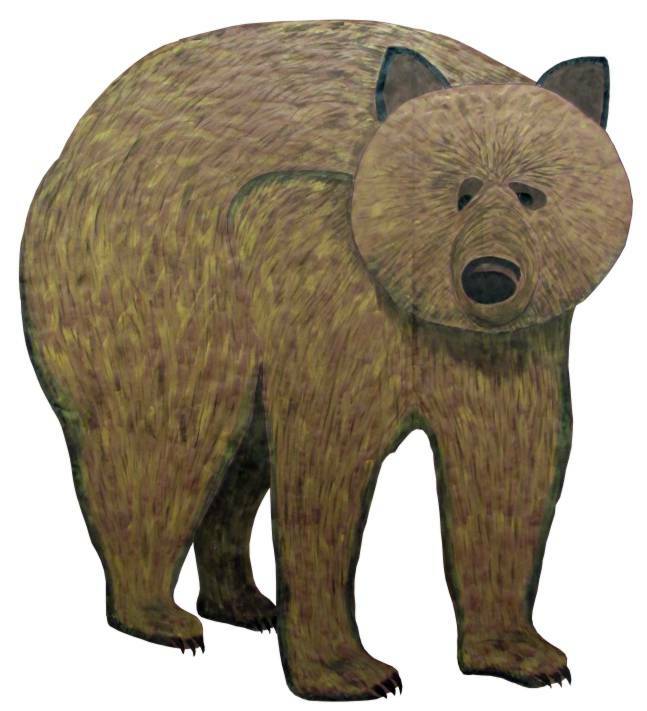 The markers were pretty bold even though I used pastels - a matter of how the wood soaked in the color - so I went over all these wood surfaces with Picket Fence (white) Distress Stain. 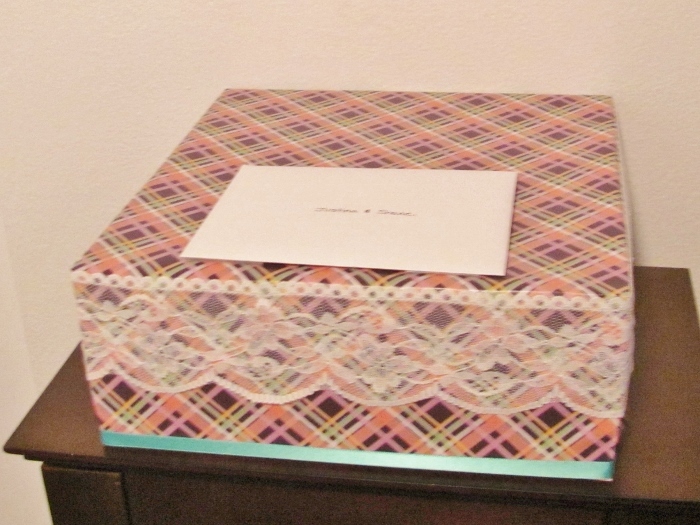 I used Distress Ink pad and a foam blender to darken the edges of all the paper corners for a shabby chic look. As a last step I took beige eyelash yarn and cut a length to glue in the opening of each hole to look like nesting material. 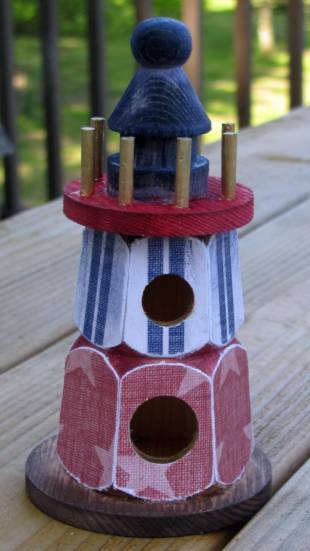 This summer I used some little wooden birdhouses (shaped like lighthouses) to make patriotic decorations. 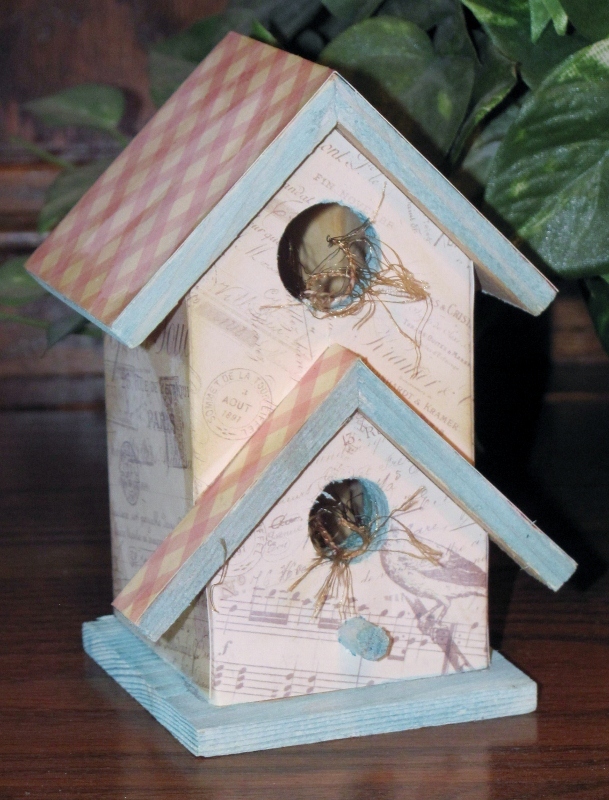 When I bought those birdhouses there were several styles to choose from so I bought two more sets of three with different seasonal projects in mind. I selected some winter/Christmas papers to cover these three. I started out wanting to make them into 'gingerbread houses' but didn't have any papers that were candy-like to decorate them. So I just made them into Christmas houses. They were designed to be hung but I removed the clunky ropes that came in them so they will just sit on the shelf. From the left, with a little turn to show more detail - this one has cute little sloping sides, a star cutout for the opening and lapped roof. 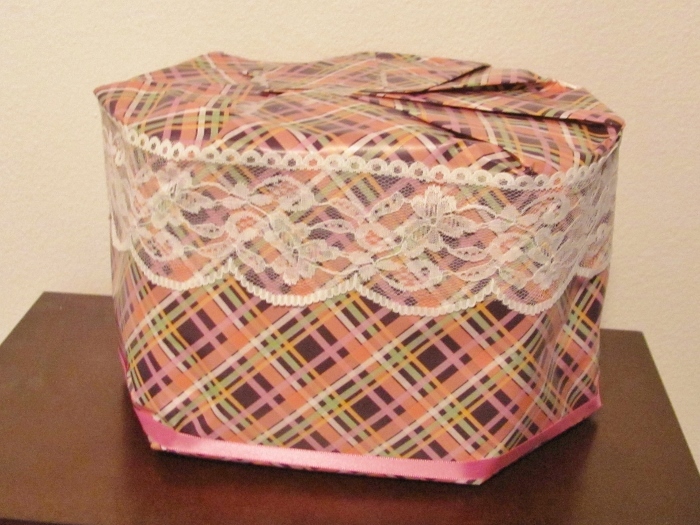 I used a scallop border punch to make strips for the roof and adhered with double-stick tape. 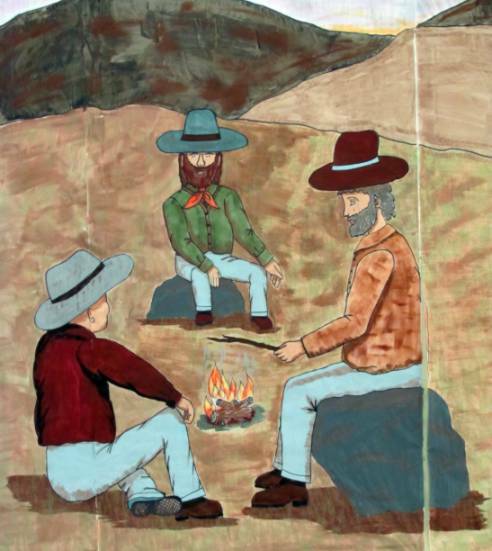 All the exposed wood portions (after covering with papers) were colored with a Krylon gold paint pen. 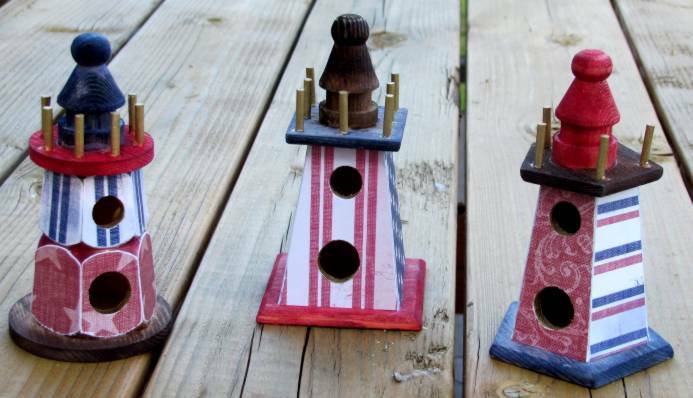 The next birdhouse is taller than the rest. It is symetrical on all sides which lends itself to a vertical stripe and a roof covering with miters. Again, all the wood surfaces are gold paint. The third house has a scalloped fascia board and a little shelf instead of a post at the entry. The entry hole is an archway, too. 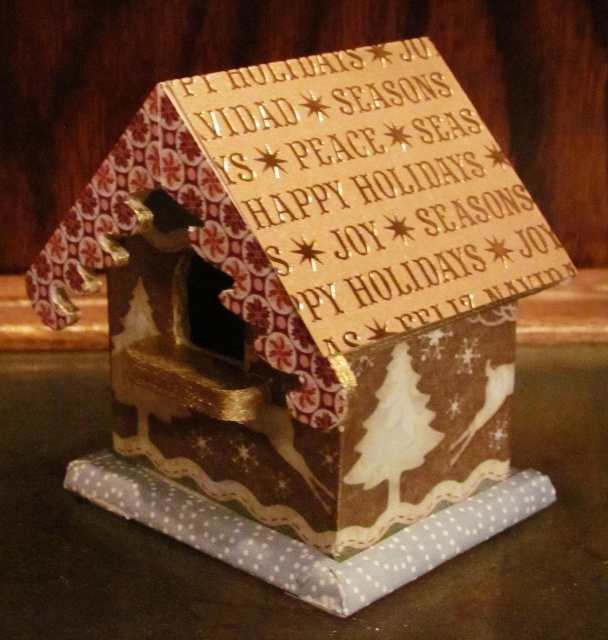 I used gold text paper for the roof and some border print with trees and reindeer for the walls. I think they turned out very cute. 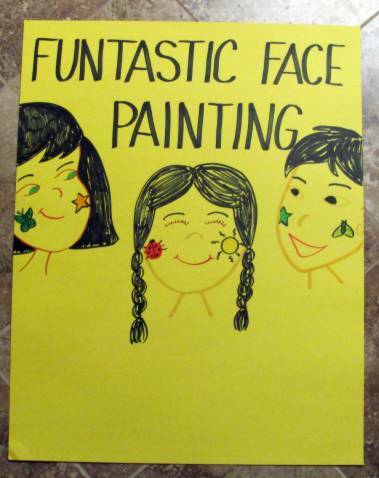 I'm looking forward to creating a Spring set out of the remaining three. For the Ladies' Christmas Dinner at church I was asked to 'host' a table. 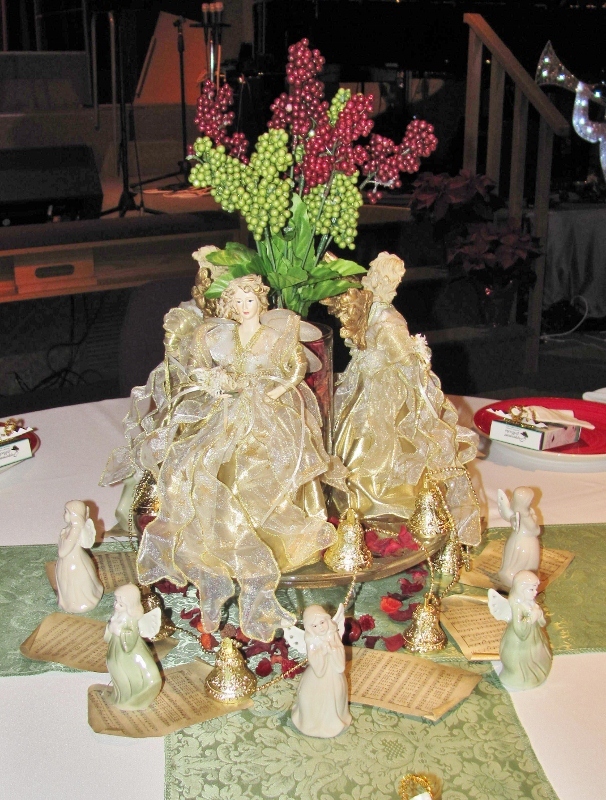 Each host decorated their own table on the theme "Glory to God". 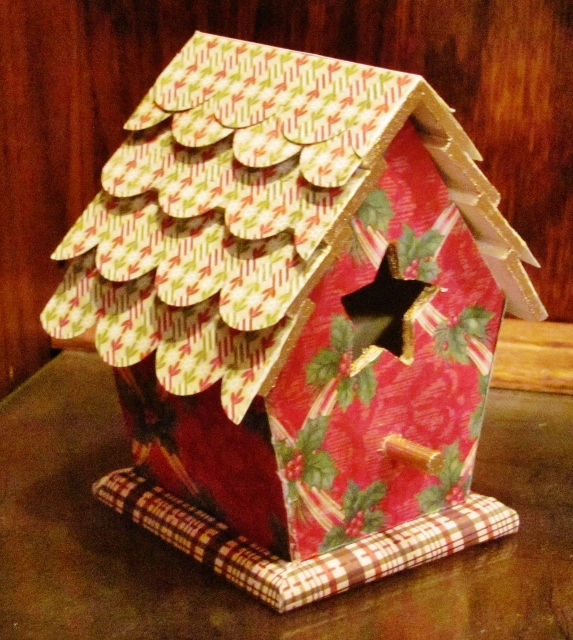 I used some things from my own Christmas decor plus items I picked up at Dollar Tree. I started with two $1 table runners in sage green and crossed them over the center of the round table. Red $1 pottery plates were laid out at each place setting. On these are $1 packages of instant flavored coffee as a hostess gift. 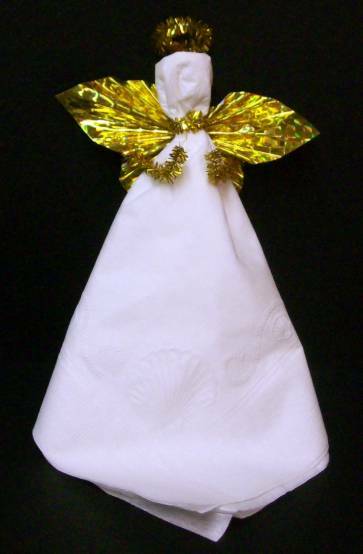 Angel napkins (leftover from last year) were placed on top of the coffee. 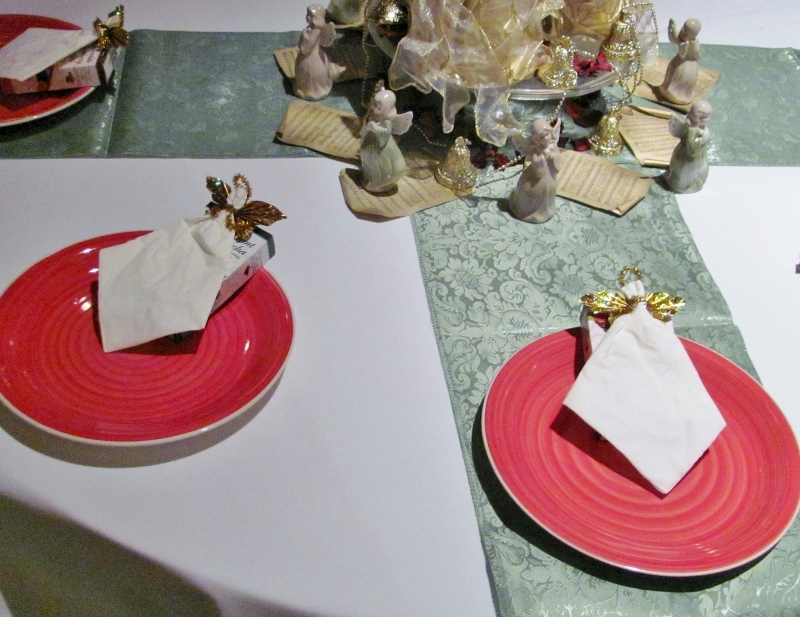 In the center of the table I placed a footed cake plate with three angels from my collection. In the center is a $1 vase filled with $1 red potpourri and a sprig of each green and red $1 berry sprays. I scattered some of the potpourri around the angels and under the cake plate. I added pieces of miniature sheet music that usually goes on my Christmas tree around the base of the cake plate and strung a $1 gold bell garland up and down around the plate. This is all circled with eight $1 angel ceramics alternating in sage green and cream robes. Our table will be using flatware that is provided at the food service. The other tables were elegantly beautiful. I had another run at the countdown blocks. 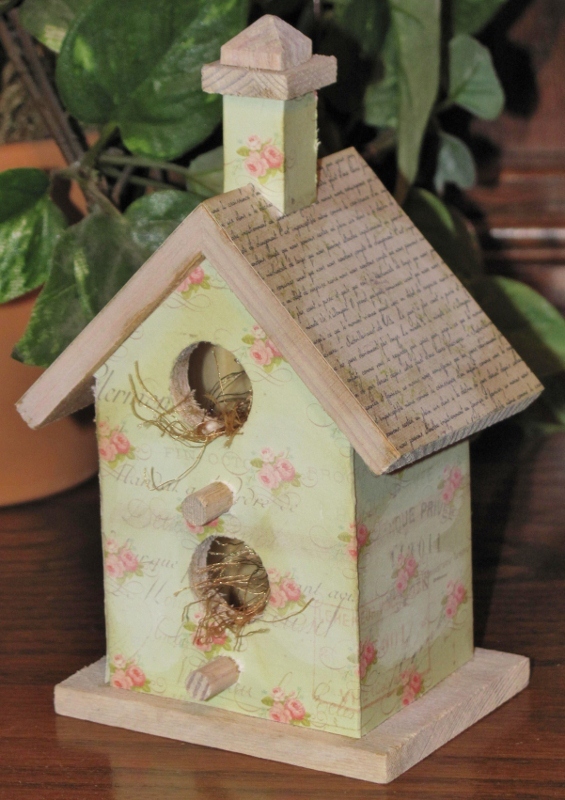 I used the same style wooden blocks, the same papers and stamps and methods of distressing. Two things different with these: The number layouts are now 0, 1, 2, 4, 6, 8 and 0, 1, 2, 3, 5, 7. Why? Just felt like it! This will ensure a shuffling of the backgrounds as the 0, 1 and 2 will have to be switched back and forth from one block to the other every day. The other thing that is different, and more significant, is the product used for the numbers. I used diecut digits from sheets of 'grungeboard'. 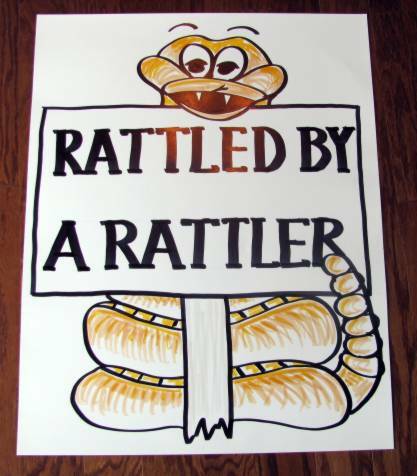 First I used a black Sharpie to color the edges and then a Krylon gold paint marker to color the top surface. They got two coats. The numbers are adhered using Glossy Accents. 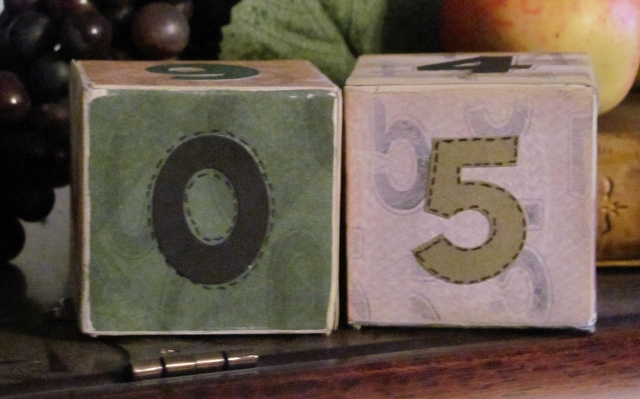 A couple of YEARS ago I bought two-inch wooden blocks to make coundown blocks. And I finally got around to making them. I used Scor-Tape to attach a variety of papers. Then I used sandpaper to distress all the seams and toned down the exposed white cores of the paper edges with Old Paper Distress ink. I used number stamps, one repeatedly on each side, with Gray Staz-On ink. The diecut numbers, in 4 colors, were affixed to the sides with Xyron adhesive and I used a fine black marker to add faux stitching around each numeral. One block has 0, 1, 2, 3, 4, 5 and the other block has 0, 1, 2, 6, 7, 8. The 6 can be turned upside down to become 9. 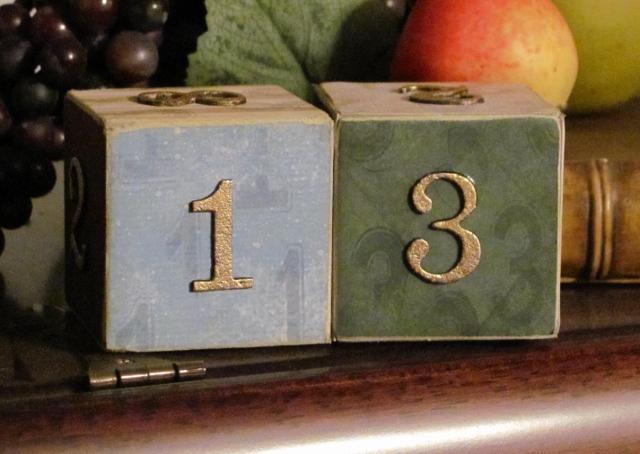 The blocks can then be arranged to count down from 31 to 01 or count upwards as a calendar. I made these with winter papers to use as a countown to Christmas, but with more generic papers they could be used year-round. 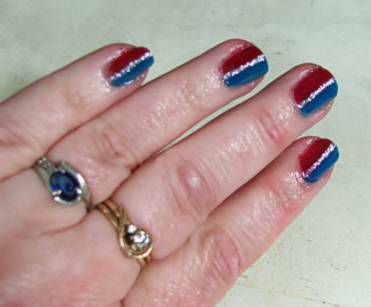 Base coat, blue (dollar store), red (dollar store), silver glitter, top coat, quick dry. They'll look better when they get a little longer. 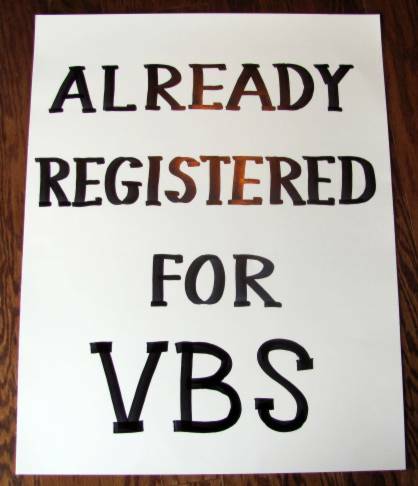 I made posters for the VBS kick-off party again this year. 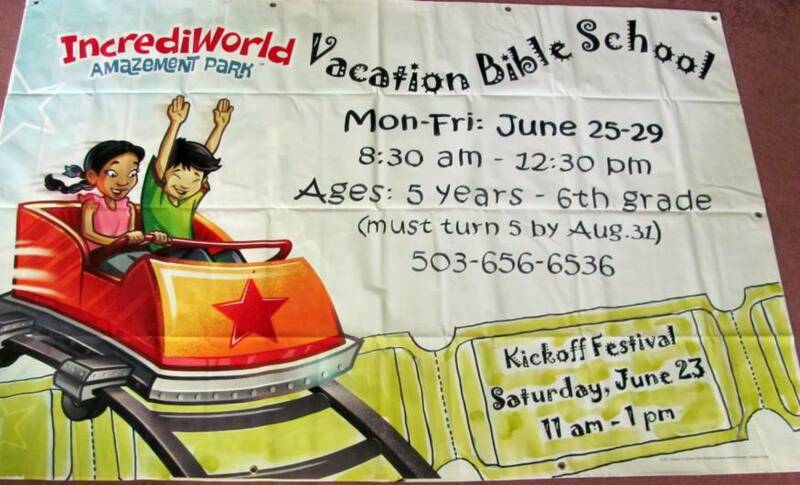 As you saw in the giant advertising banners a few days ago the theme is based on an amusement park. 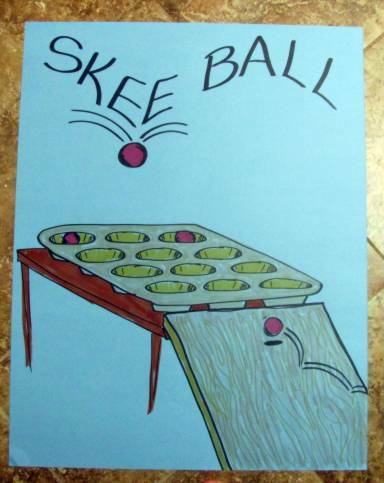 The kickoff will have a variety of games for the kids to play to earn 'tickets'. 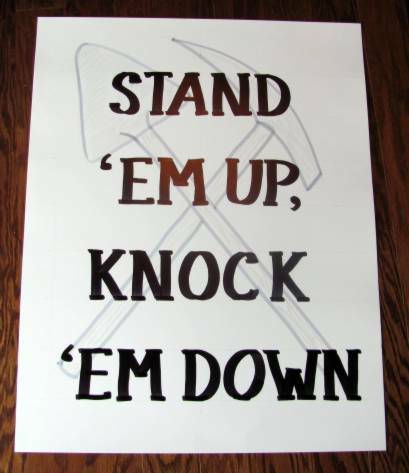 These posters will mark these stations. 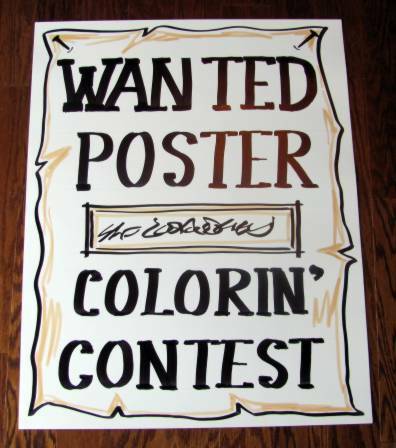 These are all lettered and drawn free-hand using alcohol markers. 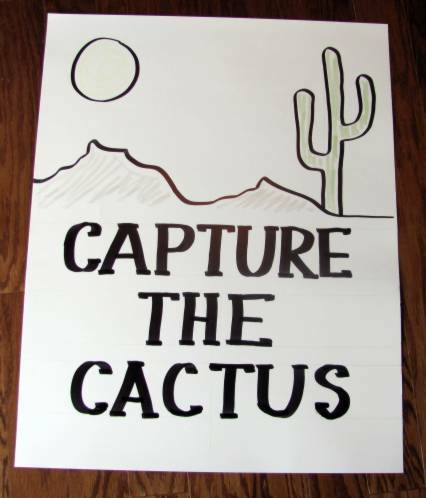 My daughter needed some props for a skit and asked me to make them for her. 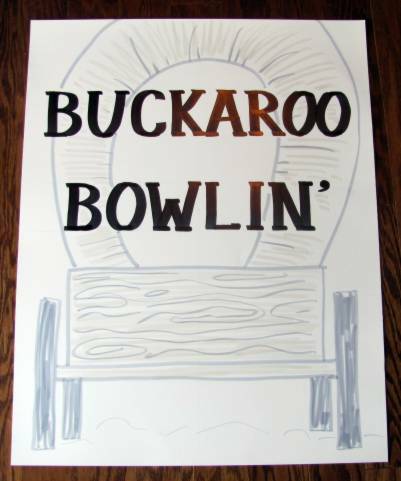 We pulled up images of 'big check' on Google Images and I sketched them out on white foam-core. 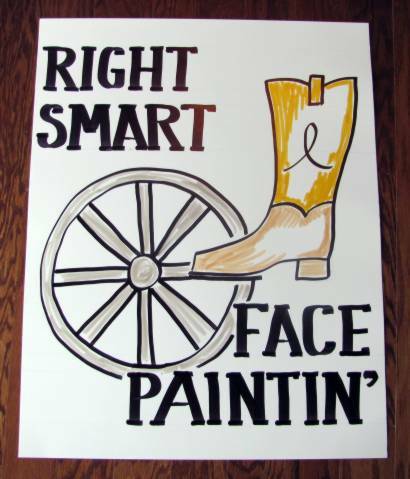 Everything is then drawn with markers. You can get an idea of the scale of these as they are sitting on the couch for these photos. I thought that there should be a logo on the checks and since the 'skit' didn't have a logo, I created this one to use. 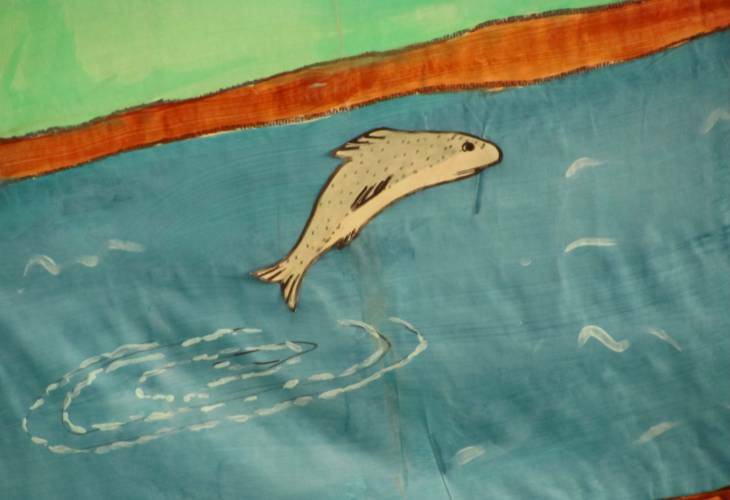 This puts the project into the realm of 'art' and therefore, it gets a blog entry. 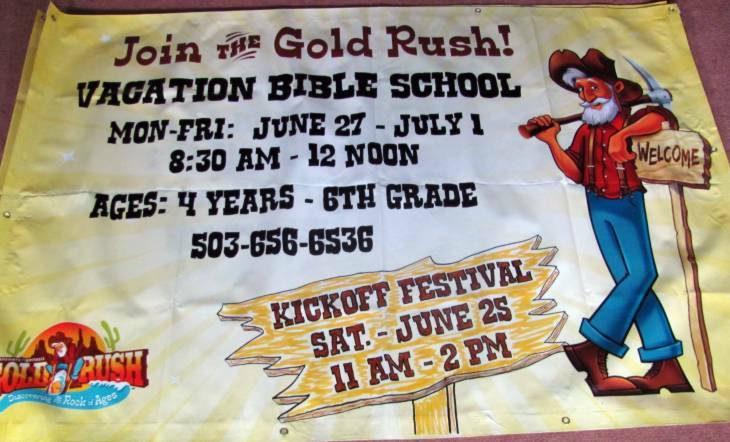 I did lettering for the Vacation Bible School banners again this year. The came with the lettering on the left and the kids in the car. To do these I measure the open space and draw a full-size block on the computer in CorelDraw. Then I look for fonts that suit the theme and type in the information. 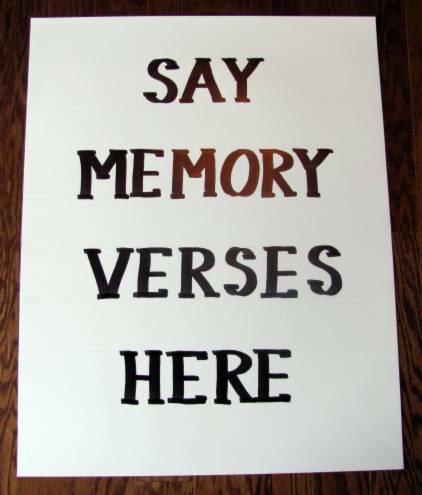 To print it full-scalee I have to move the text bit by bit over the 'page' on the screen, printing after each move. Then the pages are all taped together into a big sheet. 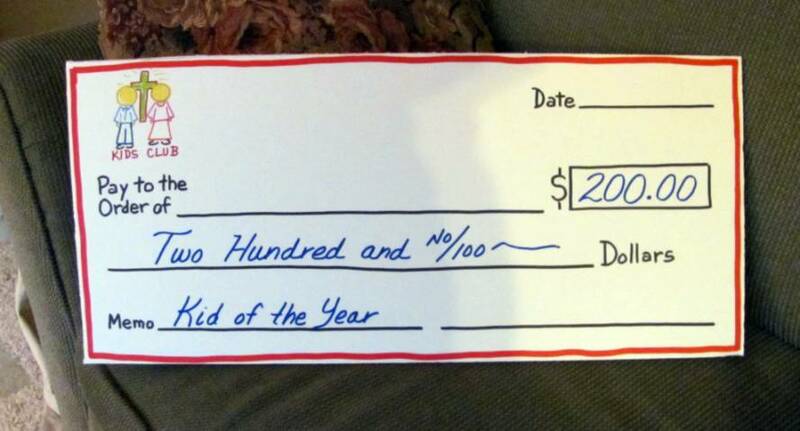 I tape this to the patio windows and tape the plastic banner over the top of it using clear packing tape. 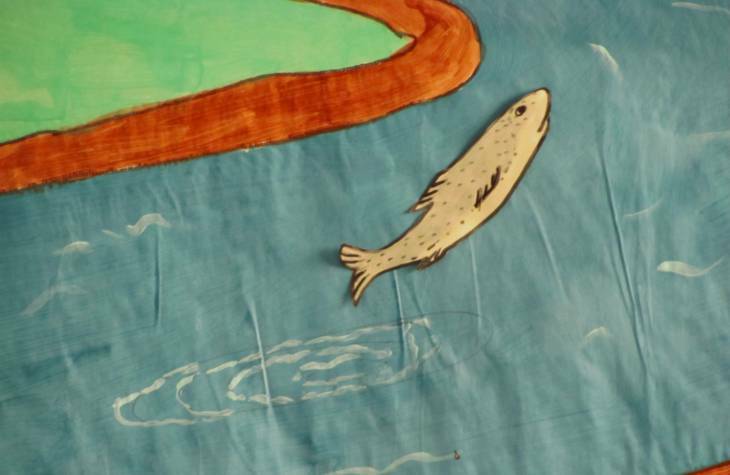 Everything is then drawn on the banner using "Marks-a-Lot' permanent black markers. I wanted to set off the information for the Kickoff Festival so I drew in a strip of 'tickets'. These I colored with 'lettuce' alcohol ink using a piece of felt on my blending tool. This has to be done very carefully because the alcohol ink will 'melt' the black marker and smear it. I made two of these and always make them with materials that will allow them to be displayed out of doors without being in danger of the weather. Occasionally I will run across things at the craft store on such a sale that I can't leave them there. 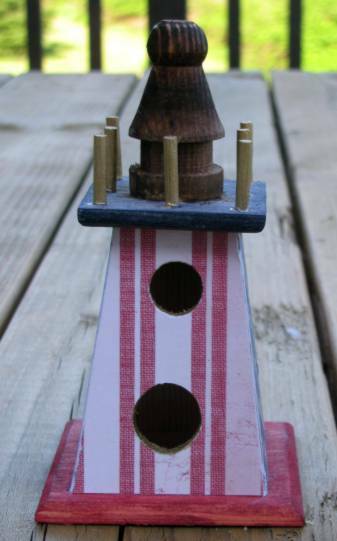 For instance, little wooden birdhouses for fifty cents each could NOT be left alone. I've had them for a couple of years - along with two other sets in different styles. 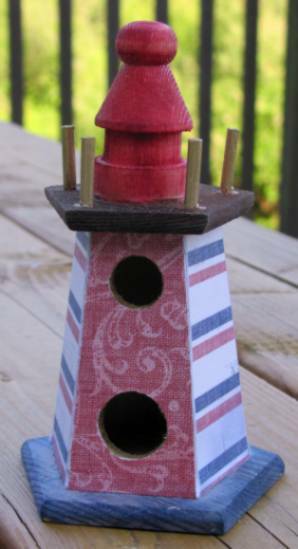 From the time I saw these birdhouses styled after lighthouses I wanted to decorate them for summer with red, white and blue. I did all the solid coloring with Distress Inks. The papers are from a 12 x 12 patriotic cardstock pad. The pieces were rough-cut and attached with Scor-Tape around the edges. Then I used a sanding block to file away the overhang. I used a gold Krylon paint pen to color the top pegs and inside the edges of the holes. 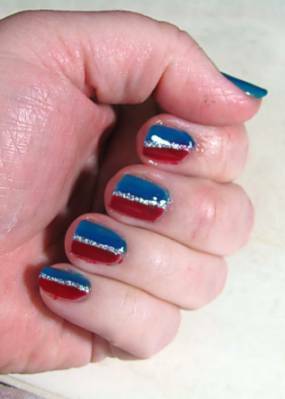 I ran across a website on different techniques for doing manicures and was fascinated by the 'sponging' way of blending different polishes to create an airbrushed effect. 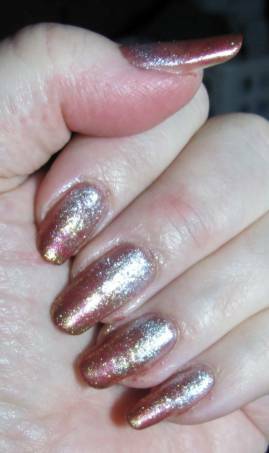 I tried this using a solid dark pink base, a light pink and a candy-apple red blended toward the center, and a silver glitter and a gold glitter blended toward the center. These have soo much more movement and depth of color in real life that is difficult to capture in a still photo. I will definately use this technique again. 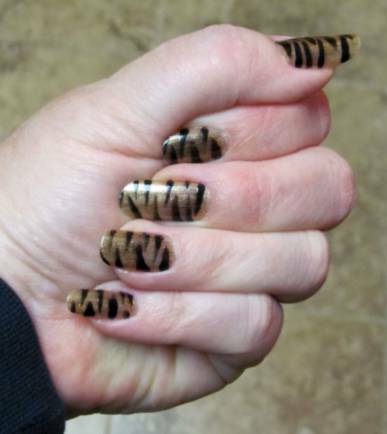 YES, IT IS STILL 'ART' EVEN IF ALL YOU ARE PAINTING IS YOUR FINGERNAILS! This is WAY off the normal project posting! 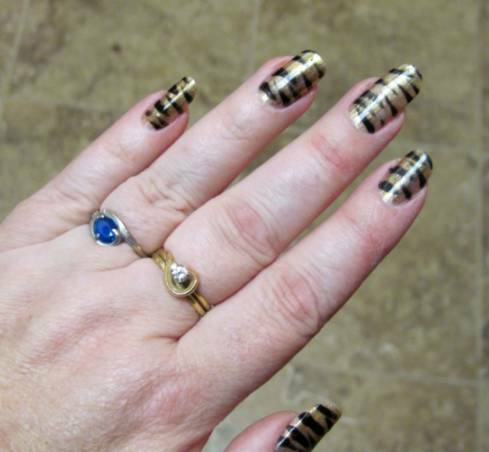 When I was on a recent cruise I treated myself to a manicure while in Costa Rica. I watched what products she was using and the techniques for painting fine details. 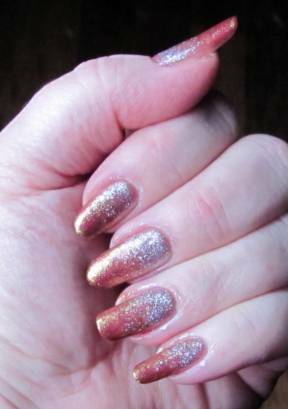 It was a long-lasting product and I didn't need to re-do my nails for about 2 weeks. I have always done my own nails, one solid color. I decided to try to duplicate what she had done and was successful. Not only that but my manicure lasted another two weeks. Yes, these are my own nails. 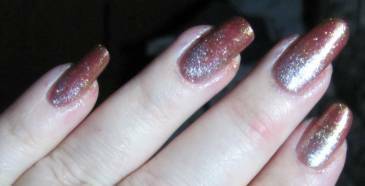 I used a clear base coat, a shimery bronze coat, a gold glitter coat, black with an ultra-fine brush, and a clear top coat. Pretty bizarre, but OK for a short time. 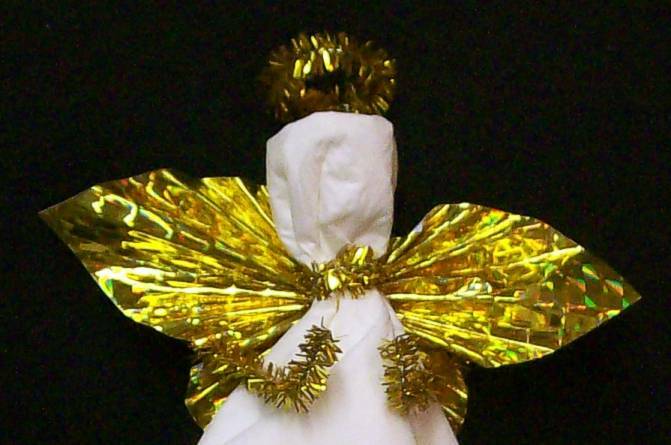 I made 150 of these angels. Can you tell what they are made from? 1) a paper napkin 2) a metallic pipe cleaner 3) pleated paper butterfly. That's it! It's one of those projects that just 'came' to me. Discussion of decorations for a Christmas dessert... Question: "what shall we do with the napkins?" WHAM! This just popped into my head full-blown. I just had to enlarge the template for the pleated paper butterfly, cut out 150 of the wings from fractal gold paper gift bags (from the dollar store), and assemble them. The pipe cleaner is folded in half and a loop created. Twist together 1 1/2 inches. Fold down top corner of napkin then fold in sides to create a 'cone'. 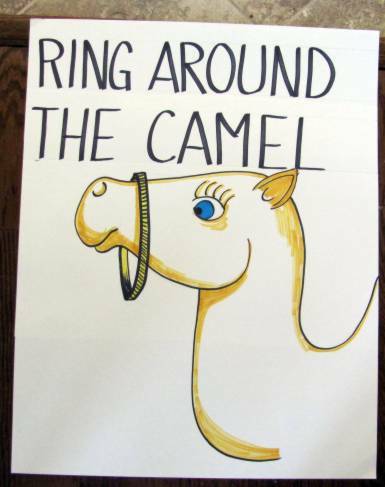 Gather a 'neck' and wrap pipe cleaner ends from back to front, cross over and around to back. Wrap pipe cleaner around center of wings. 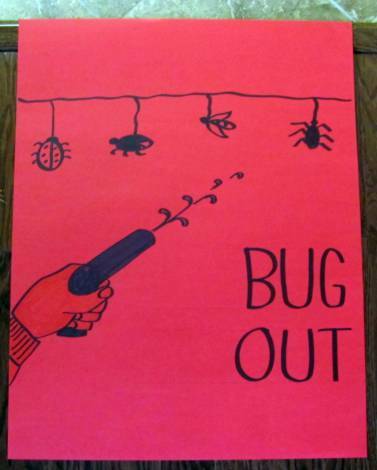 Bring ends of pipe cleaner to front between top and bottom wings. Fold into 'arms'. So glad when my brainstorms work as planned. This was my last big project for the Ladies' Retreat. 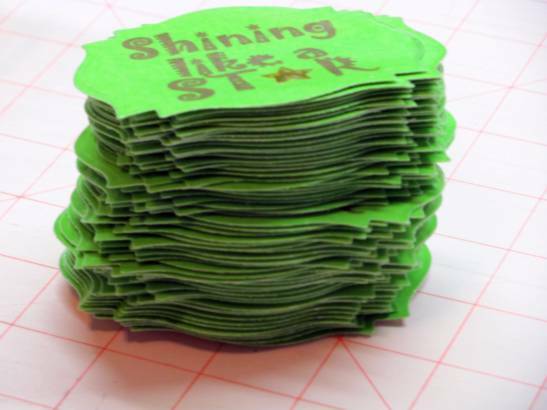 I made 60 refrigerator magnets with the colors and theme of the retreat: "Shining Like a Star". 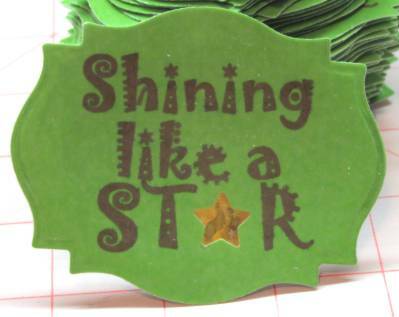 They were first printed on cardstock with my inkjet printer, then a star punched out in place of the letter A. I backed the cutout with glittery gold paper and ran the cardstock through the Xyron with laminate on both sides. These were then cut out with the Nestabilities Labels 18 die. A piece of sheet magnet was cut with a smaller Labels 18 die and affixed to the back. Worked on more projects for our Ladies' Retreat. 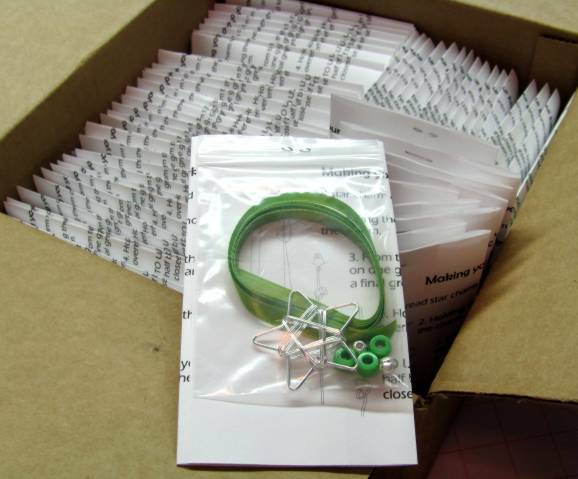 I made 60 kits for them to make their own bookmarks. 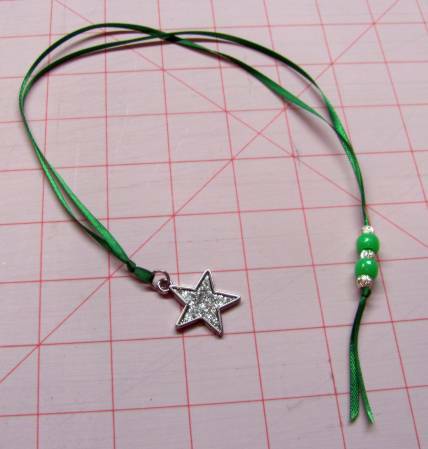 These include the illustrated instructions, a charm, three colored beads, two silver beads, and a yard of ribbon. This is a mock-up of what they look like when they are done with some differences: the ribbon will be wider, the color lighter, the charm smaller and clear, the silver beads fancier (the one above is one of 4 special kits for the speaker and uses a different charm entirely). These bookmarks are so simple to make and take about 3 minutes. This is a wide-ranging group of projects. 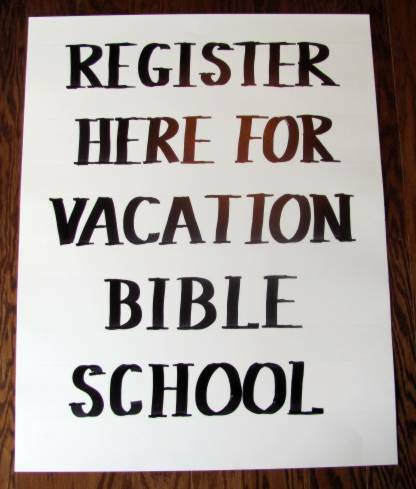 I spent some days making artwork for Vacation Bible School (back in June) and thought I'd gather all of them together to show today. We had a 'Gold Rush' theme so I was asked to pain some animals for the sets. 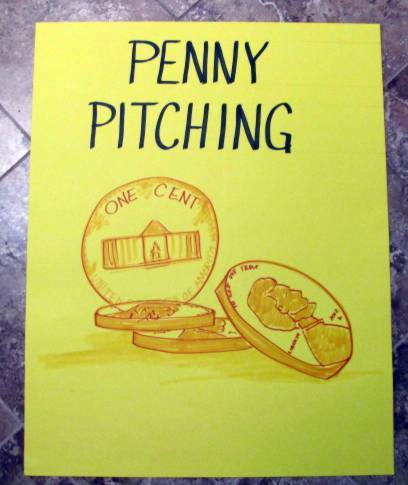 The project managers enlarged outlines with a projector and drew them out on butcher paper. 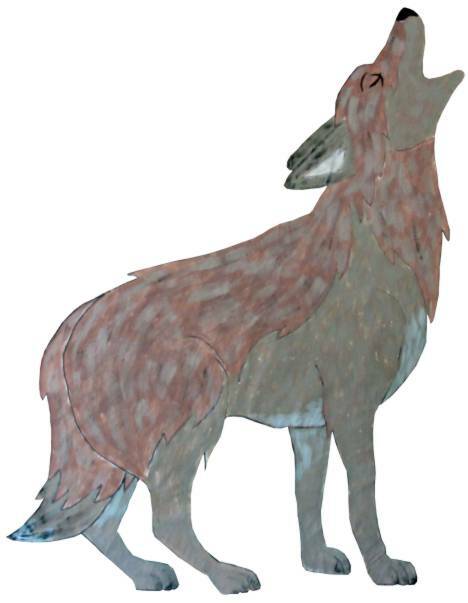 Then I painted them with tempera paints.